Chris Phelan is on a mission. He's riding across the country to raise awareness of the Ride of Silence. Although he's averaging 112 miles a day, he's making himself available at every stop to speak with cyclists and ride organizers and spread the word. Chris stopped by Spokane today and a few cyclists joined him at the Old Spaghetti factory for dinner. 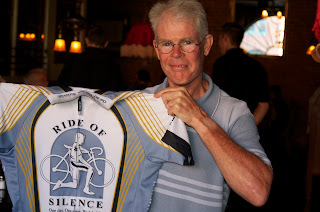 Chris is passionate about the Ride of Silence and if you want to hear that passion, just ask him how he started it. Your eyes can't help but well up as he describes the senseless loss of a friend, the realization that something should be done, the anger-induced terse email announcing that a bike ride would be taking place--"Hope you can join me"-- and the breathtaking sight of a thousand bikes showing up. Last May, Spokane's Ride of Silence was headed up by Roger Schramm of the Bike to Work Committee. Chris emphasized that the ride is not just for riders here. It's for riders everywhere. Spokane can not only have a ride downtown like the one we had. Others can organize rides in parts of the city that may be easier for people to attend. All it takes to have a ride is one rider and the willingness to spend a little quiet time on the roadway.